It’s been a little more than year since my blog, “Mama’s Recipes — and A Few of My Own,” was launched. During this time, I’ve posted close to a hundred recipes along with a little bit of what inspired me to make that dish. And you, the viewer, has responded by making my blog a success. To that end, I decided to give my blog a revamp. You are now on my old website. This is still a functional site and you can view our older posts and pages. 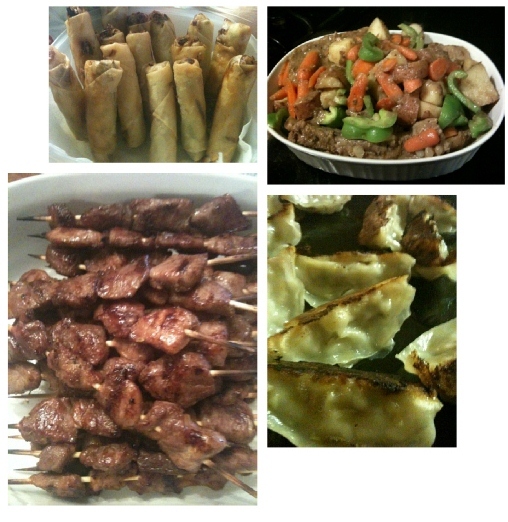 For, you can also find these posts — and all future posts — at my blog’s new web address: www.mymamasrecipes.org. I’ll eventually phase this site out. Please feel free to tell me what your needs for the new website are. I welcome your comments! Thank you for your support — and keep viewing my blog for new recipes! Growing up, I didn’t really know the difference between some Filipino stews — especially if they were tomato-based stews. Same with this Pork Afritada dish. It is simply “stewed pork in tomato sauce.” But is it a mechado or caldereta dish? Both those are cooked in tomato sauce and cuts of carrots and potatoes. My aunt explained it to me this way. She says the difference is in the cut of meat that you use and the additional ingredients you add. As for the taste, each dish is different — but tasty — even if base ingredients are the same. Heat the cooking oil in a pan and sauté the garlic and onions until fragrant. Add the pork and sauté until the outer parts are browned. Add the bay leaves and tomato sauce then simmer for 5 minutes. Add the ground black pepper and then pour-in the broth. Simmer for 30 to 40 minutes or until the meat is tender. 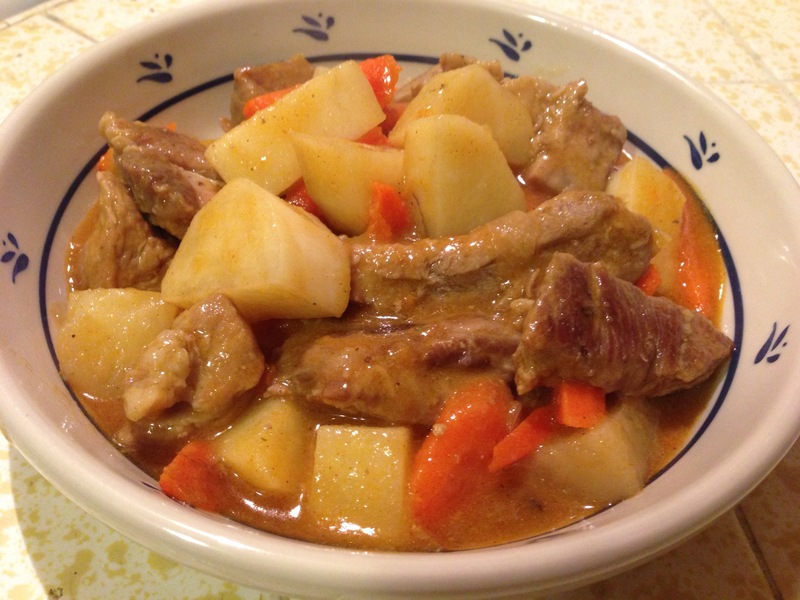 Add potatos and carrots, Simmer for 10-15 minutes or until potatos are cooked. Add the bell pepper and simmer for about 3 minutes. Add salt to taste. Serve hot with rice. My mom cooked a lot of vegetables when we were growing up. She cooked mostly Asian vegetables like eggplant. It’s one of my favorite vegetables. Whenever I get a chance, I try to make dishes that use eggplant as a main ingredient, just like this does. Yes, this dish has chicken and other ingredients. But, it’s the eggplant that really is the star of this dish. It’s very easy to make. Just toss in many of the ingredients into a wok and stir-fry. I like to serve this dish with a side of jasmine rice. By the way, if chicken isn’t your meat of choice, you can substitute, beef, pork or even tofu instead. Prepare the sauce by mixing together all sauce ingredients. Set aside. Chop the eggplant up into bite-size pieces. Place oil to a wok or large frying pan over medium-high heat. Add the onion and half of the garlic. Cook until fragrant. Add chicken. Stir fry until tender and browned. Add chili, eggplant and bell pepper. 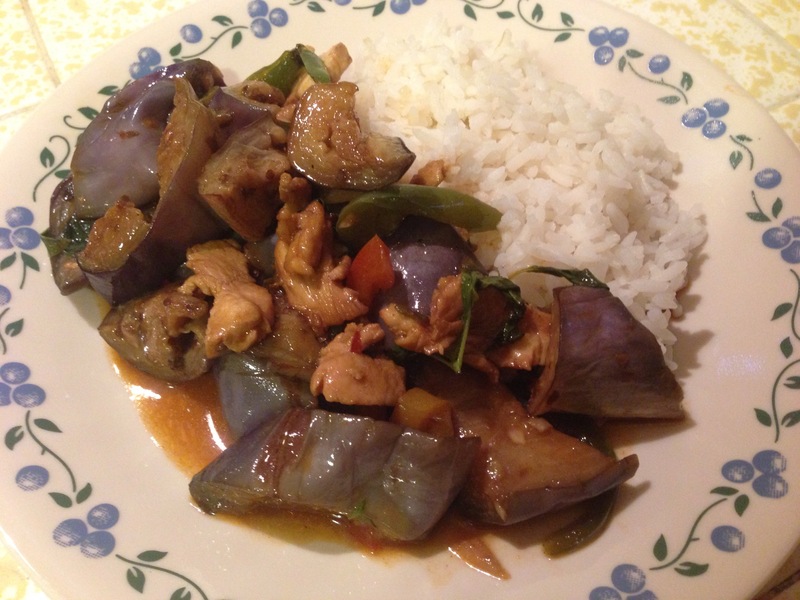 Stir-fry for 5 minutes or until eggplant begins to get soft. When the wok or frying pan becomes dry, add a little of the water — a few tablespoons at a time, enough to keep the ingredients frying nicely. Add soy sauce and continue stir-frying for 5 more minutes or until the eggplant is soft and the white flesh is almost translucent. Add a little more water when the pan becomes too dry. When the eggplant is soft, add the rest of the garlic plus the sauce. Stir fry to incorporate. Stir well. Lower heat to simmer. Taste test the eggplant for salt. If not salty enough, add a little more fish sauce. If too salty, add 1 tablespoon lime juice. Now add fresh basil and stir fry. Serve with jasmine rice.